Premium Teak Oil formula combines virgin Tung Oil with special polymers that bond with Teak and create an extra long-lasting finish. Ideal for all fine woods. Number 1 rated teak oil in independent tests. Has a unique natural golden color that will not turn dark on teak or in the bottle. Highlights and enhances grain structure. Star Brite has contracts with suppliers in the heart of the finest hardwood forests in the world - Burma. We purchase a special oil which is extracted from Burma tung trees under our strict control methods. First, the base oil is tested for its Beta factor (the wrong Beta factor makes oil turn dark and rancid) and if not correct, the shipment is rejected. After passing our Beta standard test, we treat this unique oil with heat and pressure to modify its molecular structure. By changing the molecular structure we are able to strengthen the oil, allowing it to dry faster and bond better when applied to teak wood surfaces. Next we add special polymers to further fortify the oil, providing longer-lasting UV protection. 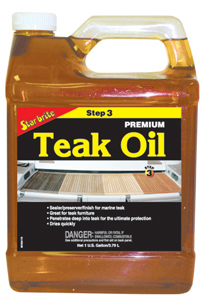 When Star Brite Teak Oil is applied it leaves the teak nourished and protected with the finest oil available. Our special oil brings out the natural patina and grain structure of teak wood. You can almost see the wood smile when treated with Star Brite. Competitive products are very inconsistent. Some are very thick and never dry, leaving the wood sticky. The surface then collects dirt, making the wood dark and dingy. Other teak products turn dark over time, indicating they have a wrong Beta factor and are turning bad. Oils with an incorrect Beta factor will actual damage your teak's appearance. Still other competitive products are formulated with cheap linseed oil to cut costs. These are thin and watery, offering little protection and are not natural to teak wood. In an independent test conducted by a national marine magazine, Star Brite Teak Oil was chosen "Best Pick" from a field of 10 competitive products. The article stated, "The hands down winner was Star Brite.... After two months, it showed no signs of weathering and retained its warm color." If your teak is subject to extremely harsh tropical conditions you may want to consider using our special Tropical Teak Oil/Sealer. Tropical Teak Oil/Sealer uses our premium oil as a base but has added polymers and UV protectant to provide much longer protection when subjected to extreme outdoor conditions. With Star Brite on the label you know you are getting nature's finest oil engineered to protect and treat your expensive teak wood.